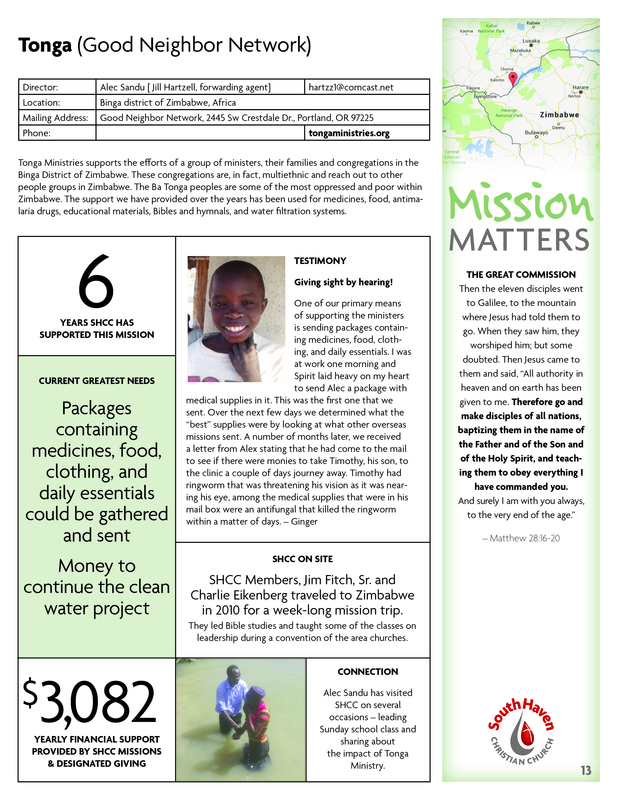 For more information about SHCC missions, contact Charlie & Naomi Eikenberg. 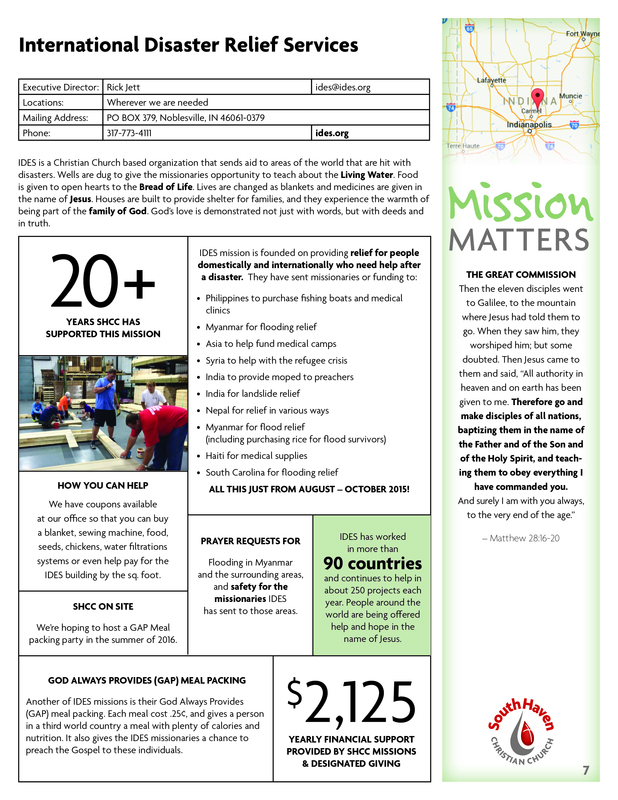 Hear that last statement again, “to be fully available right where we were.” These pages are filled with information and statistics because of your availability to the global mission of Christ. Some we have supported for ages, others for moments. With each mission there is a section about SHCC on site. This section truly is the grading scale of just how “fully available” we are. As you will see, some of these sections are blank. We have not engaged these missions personally. Does that matter? Is our monetary support enough of a connection? 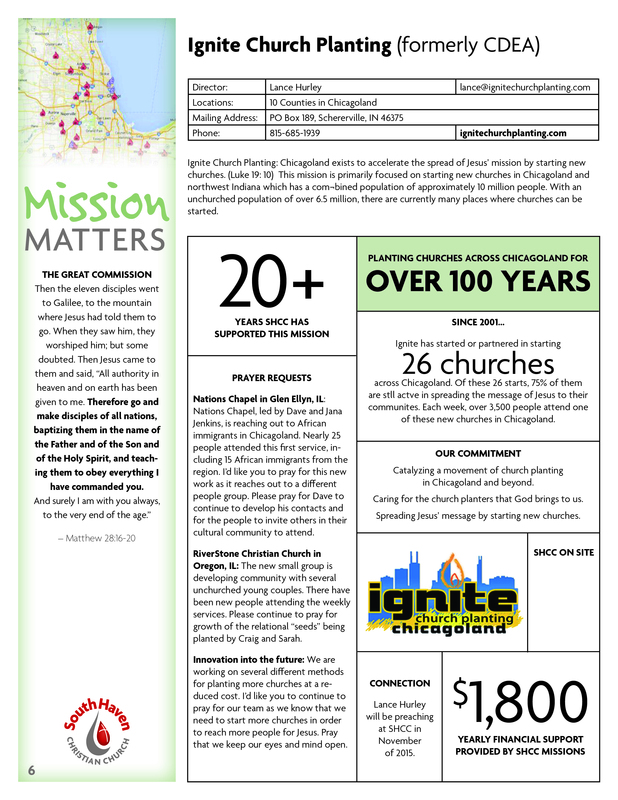 I am not sure that our financial support is all that God’s Great Commission calls for. These many missions are not even all of the ways that we have provided opportunities to get involved. We have taken several youth trips to pack meals for Feed My Starving Children. We have packed boxes for Operation Christmas Child. We have collected over 1,000 boxes of brownie mix for 500 Turkeys. And we have supplied countless needs for many of those within our congregation. And to all of this I say, “Well done!” But do we stop? Do we pat ourselves on the back? Do we find contentment in our donations and efforts? Or do we continue to make ourselves fully available right where we are for the sake of God’s mission? My hope and prayer is that we will all find encouragement from these pages and that we will also find a renewed fire and vigor to pursue the work that is still to be done. Paul writes in Galatians 6:9 Let us not become weary in doing good, for at the proper time we will reap a harvest if we do not give up. Let us be available right where we are at SHCC.